This fascinating book tells the little-known story of the Belgian resistance during World War I. The year 2014 marks the centennial anniversary of World War I, and the publishing industry has unleashed a plethora of historical and commemorative books to pay homage to this momentous and solemn occasion. 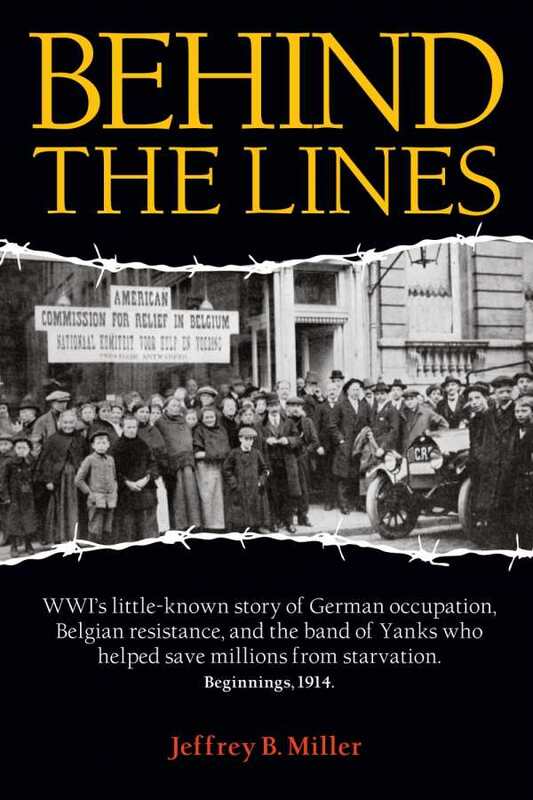 Jeffrey B. Miller has self-published a book about a rarely covered topic, Behind the Lines: WWI’s Little Known Story of German Occupation, Belgian Resistance, and the Band of Yanks Who Helped Save Millions from Starvation. It chronicles the little-known story of the Commission for the Relief in Belgium (CRB). Miller’s style is more anecdotal and journalistic than that of a historian or an academic. He begins the story in August of 1914, with the Germans claiming they need only march through the strategically placed Belgium so they can take France. This ends up not being the case, and parts of Belgium are destroyed and/or occupied along the way. Within two months, because of the military occupation and control of transportation, along with the attitude of the Germans toward their captors, food became scarce, and people—some seven million Belgians and two million French—began to starve. This tragic story is the focus of Miller’s four-hundred-page work that features dozens of international characters. Although the book is filled with a wealth of information, it is never quite clear who the main characters of the story are. There is a familial element: Erica Bunge, Miller’s grandmother who was an active spy for the Allied forces in the war; Herbert Hoover, who was a mining magnate at the time and founded the CRB (his pre-presidential era); the Rhodes scholars who served as Belgian delegates for the CRB on their school break; and the local Belgian heroes such as Abbé de Moor and Émile Francqui. They all play a part in the story, but some more so than others. Miller mentions in his preface that this is the first book of a three-part series. Perhaps with the foundation he has constructed here, he will find it easier to build a clear vision so readers can fully appreciate all the work and research that went into this fascinating story about the Commission for the Relief in Belgium. Writers like Miller bring to life the people, the heroes we do not know, and this alone is reason enough to look forward to his next book.